A couple weeks back, there was an email circulating amongst faculty and students of NUST School of Electrical Engineering and Computer Sciences about Randy Pausch's inspirational last lecture/address at Carnegie Mellon University regarding how to achieve one's childhood dreams. He died on July 25, 2008 at the age of 47. Mr. Pausch knew that he was going to die in a couple months due to pancreatic cancer. He delivered the lecture on 18th of September, 2007 but it spread around the world like wildfire. I saw the video of the lecture through YouTube. While delivering the lecture, he was calm and humorous. The address was heartfelt and inspirational. I encourage students from any and all disciplines to watch the video. Randy Pausch was known rather well in the academic community. He won numerous awards in the field of computer science. Time Magazine even added him to its list of 100 most influential people in the world. I feel that the loss of Mr. Pausch is a great loss for the academic community. 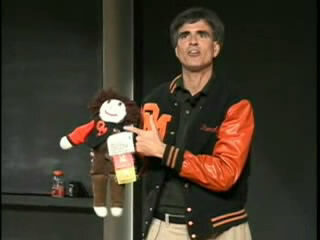 There are few people who will be remembered as well Randy Pausch will be. Agreed, I watched the lecture on YouTube too, and within the first twenty minutes I knew exactly what I want to do for the rest of my life. He'll be sorely missed, I'm certain. How i can read successfull participated team in you tournament at karachi?